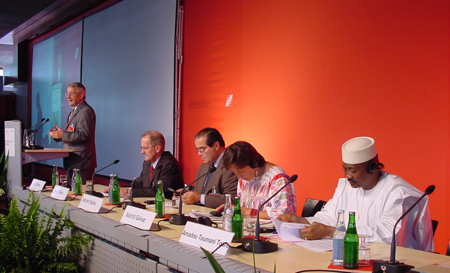 In 2002 the Swiss federal government and 26 cantons organized the second International Conference on Federalism 2002 entitled “Federalism in a Changing World – Learning from Each Other”. This was the follow-up to the first international conference on federalism held 1999. The Swiss conference brought together over 600 participants, including elected representatives, officials, academics and youth from over 60 countries. The conference also assigned conference tasks to a very high proportion of its participants. For the second conference the following three themes were singled out and discussed by participants from all over the world: (1) Federalism and Foreign Relations, (2) Federalism, Decentralization and Conflict Management in Multicultural Societies and (3) Assignment of Responsibilities and Fiscal Federalism. Each theme was further subdivided into four subthemes. The results of the conference proceedings have been published in two books and a film. The following sections discuss some of the most important explored during the conference and describes how the conference itself was structured. This is important because the conference was oriented around a new concept known as the “knowledge spiral”. The conference was structured around a process where participants expanded their individual as well as their institutional knowledge through a process known as a “knowledge spiral”. The core of the conference consisted of four hour work sessions which aimed to achieve multi-national dialogue among equals. The results were taken into conference modules such as the dialogue tables and plenary sessions. Preparatory work and review of background materials was conducted at a pre-conference. The first stage of this took place prior to the conference and entailed introducing participants to the innovative and new thinking in the three core themes. In the second stage, the purpose was to enable participants to reflect on their own experience in light of the contemporary research provided in the combination stage. This took place during the conference in a series of work sessions. Scholars, politicians at the federal and state levels, administrators, and business people presented these case studies from a variety of angles. In the third stage, participants shared their reflections and identified patterns and new insights from the prior stage of internalization. In the conference setup this was enabled by dialogue tables. The fourth stage integrated the reflection from the work sessions and the new insights gained at the dialogue tables in an integrated whole. Besides the conference proceedings the article at hand is one more example of how to create opportunities to use material for this next twist of the knowledge spiral. Discussions in the various work sessions were recorded by “scientific summary writers”, and their reports provided the basis for the following analysis. They are published in full length together with the scientific background papers and the plenary speeches of the Heads of States in the conference book “Federalism in a Changing World – Learning from each other” (McGill-Queens University Press, 2002). The analysis identified a number of common points, which can be grouped together within four over-arching themes. (1) Identity, (2) Responsibility, (3) Mutuality and (4) Pragmatism. Every individual or group in a federal system enjoys more than one identity, and these identities almost always overlap. A successful federal approach ties the identities together so that they reinforce rather than contradict each other, to create multiple identities and loyalties within a state. This can extend as far as a sense of different nationalities: one nation with several nationalities. Although a federal state structure can never be a complete safeguard against armed conflicts in the context of a struggle for regional independence, it implies and requests a culture to endorse what the French call “respect de la différence”. With this approach it becomes clear that it is a misapprehension that multiculturalism is a problem per se. The federalist approach demands that different cultures must not just be tolerated; they must be understood and even appreciated by each other. This means that one group not only speaks another group’s language, but also understands its mentality or culture. This can be called the spirit of living together. Increasingly it has been stated that regional autonomy is threatened by the development of supra-national institutions, which make decisions previously regarded as those belonging in the domestic sphere. Two interesting observations can be made in this regard. First, federal states that are members of supra-national organizations do not perceive their own federal structure to be threatened by their membership to a larger entity. Second, the relationship between the central government and the constituent units intensifies when a country joins a supra-national institution, particularly when the policy area straddles federal and constituent-level competencies. At the same time, this leads to a major role in the bargaining process. Furthermore, the process of involvement in a supra-national organization seems to make it more necessary for subnationalsubnational units to establish cross-border agreements. Participants felt that to achieve mutual understanding and accommodation of multiple identities, every citizen has to enjoy the same conditions in every part of the federation. This is often achieved through a process of equalization, which can take a variety of forms, depending on the level of commitment to “solidarity” as a working principle. One way to strive towards greater solidarity is the implementation of fiscal equalization transfers that can preserve regional/linguistic identities and ensure that all groups get high quality public services everywhere in the country, thus contributing to political stability. This inter-regional transfer can contribute to the avoidance of self-perpetuating regional disparities, especially if low-income levels are due to a lack of infrastructure or education. Autonomy is a key feature of federal systems. Federal entities are only able to maintain their political significance according to their constitutionally granted power if they participate effectively in the federation’s governance. For example, it was generally agreed that regional and local autonomy is a prerequisite for effective cross-border relationships. Without the domestic autonomy of regional units, the advantage of such agreements would be impossible to deliver. It is noticeable that these agreements rarely exist outside federal states. When subnationalsubnational units are allowed to develop their own policies in areas of specific interest and concern, the flexibility of the policy area of the state as a whole may be increased. However, it must be admitted that not all subnational units are created equally, and those that have the power to forge ahead in regard to a given policy will undoubtedly do so. Those that cannot will be left behind. This “creative destruction” will have a serious impact on the development of federal governance, especially considering the nation state in the global era. There is a clear relationship between the development of federalism and democracy. For example, in less developed countries, corruption and weak infrastructure as well as unhealthy competition can have a negative impact on poorer regions. Strong and viable democracy at the local level is therefore a vital condition for a federal system to function as a check on the government. On the other hand, problems in interpreting complicated legal documents at a local level can lead to “elite capture” of the process by those who can understand them, and corruption then appears to prevail at each level of government and not only at the federal level. “The principle that s(he) that pays, decides”, is well known. There was general consensus during the dialogue that public services should be allocated to the different levels so that citizens obtaining benefits from, paying the costs of, and deciding on public services belong to the same group. Therefore, the level of government responsible for a particular service should have the capacity to raise taxes to pay for that service. However, there seems to be a gradual erosion of effective spending responsibilities across federal countries, with the central government or supra-national organizations more frequently dictating norms and standards. Revenue-raising powers of subnational governments are still rather limited in many nations, and do not match their spending responsibilities. A more effective application of the above principle would promote autonomy and accountability and would be likely to promote greater public sector efficiency. The capacity of many regional and local governments to implement projects or financial planning and budgeting is often inadequate. If one wants to empower local government, money should not come from the top but should be sourced from local levels as much as possible. Where it is not possible that the state and local level raise their own money, central revenue sharing needs to be both clearer and less unilateral. Governments at all levels must be made to face the financial consequences of their decisions in order to ensure fiscal discipline. One function of federalism is to create a certain amount of competition among subnational entities. Therefore, although a certain amount of equalization is necessary to foster a sense of solidarity among these entities, many participants agreed that full compensation of poor regions through equalization grants should be avoided. Any equalization system should be designed with the utmost care, since poorly thought out regional balancing is responsible for a reduction in local revenue-raising efforts, and lack of motivation among local authorities to search for innovative ways of consolidating their revenue. While matching grants are intended to offer incentives for efforts in tax collection, there is a contradiction in the regional balancing principle, since those with high revenue-raising capacities receive more funds. The matching grant for resource mobilization rewards relatively rich provinces for additional tax effort. Fiscal equalization based on actual, rather than potential, fiscal capacities can result in an “unhealthy” tax competition. It could be said that cooperative federalism is a kind of collusion, aiding governments instead of citizens. It should be noted that an excess of competitive federalism can lead to inter-governmental conflicts, and that fear and anger are destructive in a federation. Excessively competitive fiscal policies, whether or not they are stimulated by equalization systems, often produce undesirable results. But while most tax competition is aimed at attracting investment, it has been observed that this is only a secondary factor in investment decisions, although firms can sometimes respond unpredictably, undergoing corporate restructuring in order to take advantage of fiscal concessions. As previously discussed, respect for diversity is a cornerstone of a democratic polity – and even more so in a federal environment. Minority rights and cultures should not only be sheltered but also secured by the state.Group rights must be protected through a country’s constitution. In making such a constitution, it is vital to respect another cornerstone of democracy: that the people, not the elite, should make decisions. For example, to ensure the representativeness of the constitution-making body, it is necessary to involve the people, notably through public debates. The inclusiveness of the constitution-making process in developing a constitutional compact is decisive for the development of a common identity underlying nation building. The principle behind this inclusive approach is that the more people are involved in consultations or negotiations leading to new laws, and the better informed they are, the more motivated they will be to implement those laws. This is also true of the involvement of subnational units in the federal decision-making process. New research on member states of supra-national organizations suggests clearly that in federal states where those responsible for implementing agreements at a subnational level are involved in the negotiation process, implementation records are better. The participation of subnational units in shaping the foreign policy of a federal state whenever their powers or essential interests are concerned strengthens that state’s foreign policy. In addition, subnational units bring know-how and experience relevant to the negotiation, which are often lacking at the central level. As a rule, the participation of the subnational units is crucial for the federal government. The federation needs the willing cooperation of the federated entities in order to implement its foreign policy and international law. Federalism does not provide a panacea for all the ills of a multicultural society but it does offer a greater capacity for solving problems. However, it should be noted that a federal model in one state cannot be transferred wholesale into another. The success of any federal solution depends on how a given state copes with the group rights and cultural rights of its diverse people, and how it creates a feeling of security among them. Any power-sharing arrangement must empower the minorities and reduce their fear in face of the natural power of the majorities. This is especially true when a country has suffered from a violent conflict. When this has been the case, tremendous and sustained efforts are needed by all parties to work for what is needed most: reconciliation and reconstruction of the country while rebuilding trust. In this phase of trust building, particular emphasis must be placed upon the political process. Additionally, the role of human rights is crucial and they often cannot simply be defined in the abstract, but require mutual respect and negotiated agreement among the various members of diverse societies. While looking at federalism as a means by which to solve multicultural conflicts, one has to be aware that federalism is not only a device for self rule, but also a structure for shared rule, and this shared rule structure is equally important. If federalism is understood as a license to self rule without at the same time fostering a cooperative spirit of living together, it can lead to local tyranny. A concept and vision of federalism have to exist, according to which a commitment to power sharing is at least as important, if not more important, than the legitimate quest for autonomy. Federalism can only bring about good governance if it finds a middle path between self-determination and living together, fiscal autonomy and solidarity, respect for cultural identity and a commitment to a mutually agreed-upon common good. Consequently, it is necessary to understand federalism as a system of mutual checks and balances. This means that both the state and the constituent units need to have a strong position in the constitution. This notion of balance is crucial. Minimally, it gives expression to two manifestations of popular will: national and regional. However, at the same time the system of checks and balances must be supported by a strong, respected, and independent court system – albeit a court system that is itself reflective of diversity. Federalism is a process that aims to create a more complex system in order to simplify things. Like the engine of a Formula 1 car, it is efficient but complicated, as can be seen by the phenomenon of equalization, a typically complex feature of a federal system, encompassing financial, economical, political, legal and even ethical components. The greatest possible coordination between the different positions of the subnational units and the federation often leads to a complex compromise. For example, during the process of decentralization the emergence of parallel administrations and bureaucracies at central, regional, and local levels often leads to a more complex system in which there are no clear-cut allocations of responsibility. This can facilitate elite capture by politicians who tend to make short-term decisions, whereas most of the features and incentives of a successful federalist system are long-term issues. In reality the fact remains that federalism is complicated to arrange, difficult to manage, and cumbersome in operation. But it’s the price some federal countries have to pay in order to live together. In the search for possible policies, discussions in a federal system are often less driven by the insistence on getting it right than by a spirit of getting along. One possible explanation is the complexity mentioned above. Additionally, each level is empowered to design its own adapted policies, which often result in informal and pragmatic solutions. For example, if a policy needs regulation at the federal level, it often becomes stuck, and the subnational units have to adopt a less formal response to the issue in question. Or, if a national border is a hindrance to the successful delivery of policies, subnational units increasingly develop cross-border relationships, with or without the involvement of the federal level. Hence, different examples show that explicit authorization by law is less important than the political power of a state in the federation. However, the conference discussions demonstrated that it is wise to make a distinction between more formal agreements and informal arrangements (arte di arrangiarsi). Some participants felt that as long as solutions continue to exist in a legal limbo, they lack the necessary power to have a significant impact. Federalism is not cast in stone; it grows differently in different soils and its success in one state may not be replicable in another. There is no single model to follow and it is difficult to transfer elements from a model in one country to a model in another country. All federalism can do is provide examples which may prove to be useful reference points for other societies. Historical and cultural traditions mean that the same conclusion pertains to the transferability of entire policy systems. Each state must develop its own unique and pragmatic approach, if necessary with the help of the international community and transnational institutions. A major issue running through most of the sessions of the second International Conference on Federalism 2002 held was the crucial importance for effective federations of the presence of an underlying supporting political culture and attitudes. Whether in the conduct of foreign relations, the management of decentralization and conflict in multicultural societies, or in the financial arrangements, effectiveness in practice has depended not just on appropriate institutions and processes, but even more upon widespread respect for the values inherent in federalism. A major conclusion with significant relevance for future discussions, therefore, is the need for further analysis of how such values, so necessary for effective federalism, can be fostered and developed. A second major theme emerging from the St. Gallen conference was the importance of the financial arrangements in terms not only of economic efficiency, but for their impact upon political policies and decision-making. Particularly important are the features of equalization arrangements and the extent to which they contribute to, or undermine, the preservation of regional and linguistic identities and the promotion of “solidarity” within federations.